In a week when we emphasize that Jesus came to bless everyone, we shouldn't be surprised at the folks who gather around him today, just as when he was born, to find grace to bless and serve even in their time of need! It had been a difficult week. I hadn’t slept much in several days. When I got up Sunday morning, it was all I could do to fix the hundred baloney sandwiches that are my part of the Sunday breakfast we provide after worship in Derby Park. Running late, as usual, I was out the door in a hurry with my shoulder bag, some groceries, and three bags of sandwiches and off to Derby. I had prepared a couple of messages that I was still trying to decide on. One was a continuation of a series we had been following through Psalm 23. The other was about Jesus’ word on faith to move mountains in Matthew 17:19-21. Some days I know what I’m going to teach on and some days I’m not sure. Sometimes I get to the park and while visiting with our friends in the hour or so before worship somebody will tell me about something they’ve been through or a crisis they’re facing that changes the direction I’ll go with the message. I know it sounds somewhat improvised, but it’s my way of trying to be open to where the Spirit may lead in the message for that day. This past Sunday He apparently had a couple of different ideas. When I got to the park, I realized I’d forgotten my Bible in the rush to get out the door. I had my phone & could read from it but I really prefer a real Bible as most people on the street don’t even have a phone. I kept hoping one of our volunteers would bring a Bible, but no luck. Pretty soon it was time to gather everybody together and begin our worship. During the song leading my mind went blank on one of the three songs we sing pretty much every Sunday. I asked if anybody wanted to lead a song (which can be a little risky). Joana d’Arc (Joan of Arc) started singing a song right away I’d never heard. Like many people living on the street long term, she’s evidently struggling with some deep mental/emotional issues. Joana has made a few enemies, but for the most part, everybody is very kind toward her and protective of her. Pretty soon several others who knew the song joined her and it became a very special moment of worship for us all. When it got to the message, I explained I’d forgotten my Bible and was about to pull out my phone when a homeless young man to my left said: “You can use mine!” He handed me a well preserved Bible with a beautiful cover on it. It was certainly the most valuable possession he owned. I’d never seen him before, but there he was with his Bible, ready to share. I had decided to teach from the passage about faith moving mountains when the guy sitting next to the one who loaned me his Bible said: “Read Philippians 4:11-13.” I was thinking "but I’m not ready to teach on that," then I looked at him again and he just said real firmly, “Read Philippians 4:11-13.″ Yes, another homeless guy who lives in the Word… So I started turning to Philippians 4:11-13. I don’t know if you saw it but about a week ago I sent out an email to the prayer list group about Philippians 4:13. It’s a passage that’s dear to me and that I’ve been thinking about a lot lately. That’s why I sent out that email. But Joseph, the guy who told me to read that passage knew nothing about my email. What made him tell me to turn to just that passage? Personally, I understand Paul’s declaration, “I can do all things through him who strengthens me,” not as a triumphal proclamation of God granting me success in the face of all challenges, but of his giving me the strength to make it through the most difficult times of life. It’s not about triumphant victory. It’s about finding the strength to go on in impossible times. And who was telling me the passage I needed to read that morning? A homeless guy named Joseph. Then the guy who loaned me his Bible said: “And read Psalm 77.” I almost lost it when he said that. It’s a long story, but that Psalm takes me back to the very first miracle I personally witnessed the Lord perform in Recife, some thirty years before, almost to the day. You know what message I heard Sunday in our little assembly of homeless men and women in Derby Park? The message I heard was, ‘Dennis, this church isn’t here just for you to minister to your homeless friends. It’s here for your homeless friends to minister to you. Because I’m ministering to all of you through my church. YOU included!’ Sure, there are those who come to our Sunday worship service mostly for the breakfast. But, there are those who come also hungry for the Word. And with a word of their own to share. You know what message I heard Sunday in our little assembly of homeless men and women in Derby Park? The miracles of the forgotten Bible God provided, the unintended passages His hidden servants called forth, the beautiful song his broken daughter sang… all of this spoke to me of miracles... little miracles... discrete ones... the kind of miracles that are really easy to miss... unless you’re badly in need of one. And I heard my Lord saying, "This may not look like my church to a lot of other people, but you and I know it’s my church. And that’s what matters." And then, "My church ministers to all who are in need. Not just the ones in physical and material need, but the ones in every kind of need. It even ministers to ministers." I can do all things God expects of me with the help of Christ who gives me strength and power. Can you say an amen to that? Thanks for your prayers. For me. And my family. And for Jesus’ family and friends in his church in Derby Park, Recife, Brazil. Dennis Downing is a dear friend and partner in Christ who has served the people of Brazil with grace for four decades. 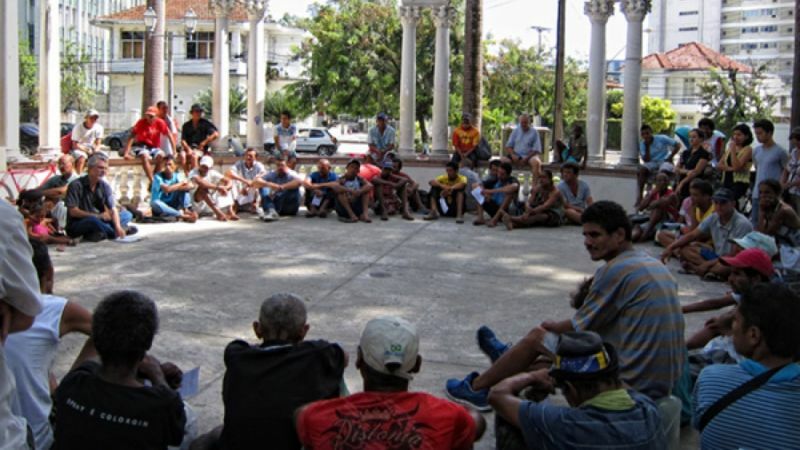 He is also a partner with Heartlight.org with his parallel online ministries of iluminalma.com and Hermeneuitca. 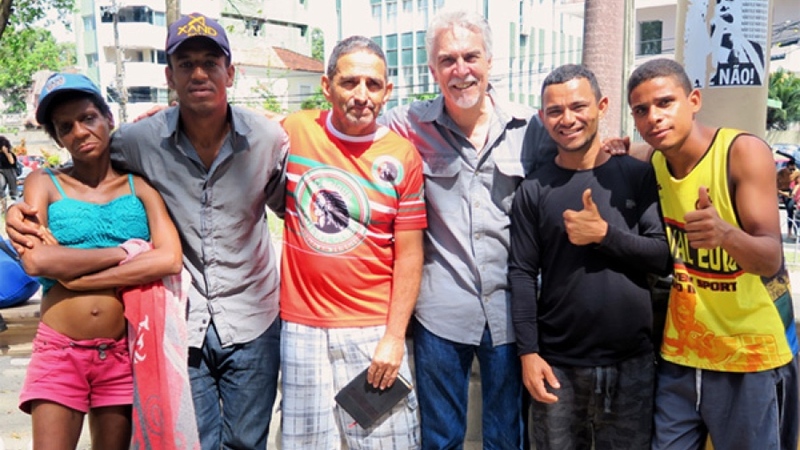 Dennis works with a congregation of people who live on the street in Recife, Brazil, and has for many years, a ministry supported and encouraged by our friends, Max Lucado and the Oak Hills Church in San Antonio, Texas. "Little Miracles" by Dennis Downing is licensed under a Creative Commons License. Heartlight encourages you to share this material with others in church bulletins, personal emails, and other non-commercial uses. Please see our Usage Guidelines for more information.